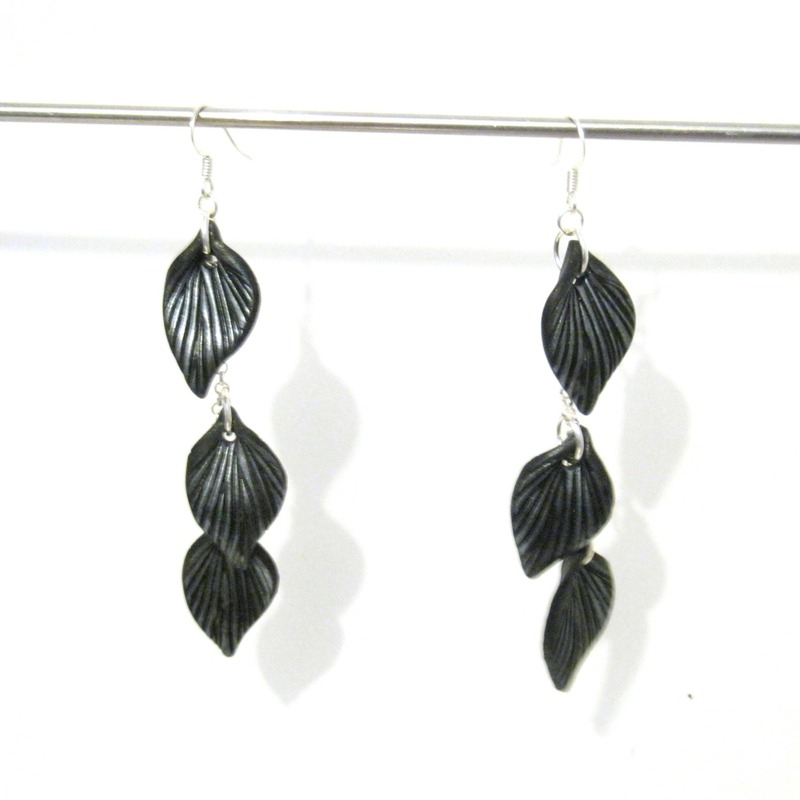 Lightweight, flirty dangle earrings featuring a trio of black and silver leaves along a silver plated chain. Earrings measure 3.5 inches from the top of the hook to the tip of the last leaf. All silver plated findings. * Sterling silver version uses handcrafted hooks and oval chain. These are a great companion to my leaf pendants and bracelets. This pendant is a beautiful reproduction of a dogwood blossom. I thought it would be perfect to wear for Easter. I am delighted with the artistry. Absolutely beautiful!!!!!!!! What an amazing work of art! So excited to gift this to my dear friend who survived cancer and loves daisy's. Excellent customer service and custom order. Highly recommend! Thank you so very much! Arrived wrapped and ready to gift in safe wrapping, and so fast. 5*****!!!!! This shawl pin is so pretty in real life! It is well made, finished beautifully, no snags or burrs anywhere on the pin! (Important so it doesn't snag the merino yarn the cowl is made from!) As soon as it arrived I had to put it on the still-in-progress cowl! Lovely! Bonus: the pin came in the mail all protected in a nice white jewelry style box with satin ribbon-so classy! Thanks valenstar!! Absolutely beautiful! Looks just like the picture and it came early! She was so nice and answered all my questions before I even ordered and was very quick to reply! I am so pleased with this order, my mom misses home a lot and these were her favorite flowers that remind her of home. I cant wait for her to open it for christmas! Thank you so so much! Yes, I wholesale to legitimate brick and mortar locations. Please feel free to convo me for details as Etsy Wholesale is being closed as of July 2018. I love customizing orders for clients! Anything from creating a new flower color to changing the length on a necklace or bracelet to creating a special piece just for you or your bridal party. All of my items ship in appropriately sized kraft jewelry boxes closed with a length of ribbon and arrive ready to gift. How long does it take to receive a custom order? Custom orders typically ship within 7 business days or less. If I do not have the necessary supplies on hand, I will let you know when we discuss the order and provide an estimated ship date. Orders within the United States typically arrive within 5 business days of the SHIP date but international orders can be expected to take anywhere from one to six weeks to arrive. I am located in the EU. Do your prices include VAT? No. We are not registered to collect VAT. You will be responsible for any associated VAT and handling charges that are levied by your government or postal service. South Carolina residents: I am obligated to collect the 6% sales tax for our state. How do I keep copper looking bright? My usual method is to combine equal parts lemon juice and water. Dunk your copper in the lemon water and cover with salt in a clean plate/dish/napkin. Rub until the copper is shiny and bright. Rinse well with clear water or wash with a touch a dish soap at the same time you're washing your hands. Dry with a soft cloth. Store copper between wears in a resealable bag. I include bags and anti-tarnish tabs with every order.